Item : Angel's Dream Room(M001). 1: 24 Wood Miniature Dollhouse Diy craft kits. Full illustrated assembly instruction (original written in Chinese) included, but. Those are all handcraft kits (not be assembled), and includes all materials ( such as wood chip, plastic, fabric, wire, light bulb, paper….). Laser cut on Japanese crepe acid free paper. This is the fuchsia flower. 1:24 Wood Miniature Dollhouse Diy craft kits, Room Box, Butterly’s Love, M002. M002, Butterly's Love ( Living Room). 1:24 Wood Miniature Dollhouse Diy craft kit. No glue or paint is included. Those are all handcraft kits (not be assembled), and includes all materials ( such as wood chip, plastic, fabric, wire, light bulb, paper….). 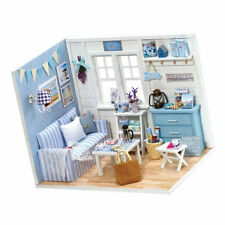 1:24 Miniature Dollhouse Diy craft kits, Room Box, My little buddies (Blue), M007. Room Box: My Little buddies (Blue), M007. 1:24 Wood Miniature Dollhouse Diy craft kits. No glue or paint is included. NO GLUE INCLUDED. YOU HAVE TO ASSEMBLY. DIY Wooden Miniature Coffee Doll House Kit W/ Furniture/ LED Light 1/24. Condition is New. Shipped with USPS Priority Mail. Dust Cover Included. Color: wood color. Size Approx: each box:19 15 4cm nearly 7.5 5.9 1.6 ". Fit for 1:24 scale dolls. Bedroom, kitchen, sitting room, dining-room four scenarios combination, delicate and simulation, to the kids all aspects of the simulate real family. 29 Pcs Set Dollhouse Miniature Unpainted Wooden Furniture Suite 1:24 Scale. 1 Set Wooden DIY Dollhouse Kit (Batteries are not included). - Material: Wooden, Cloth, LED Light, Paper, etc. - Warning: Chocking Hazard-Small parts, not for children under 12 years old. - 2 Pieces AA (1.5V) Batteries are needed, but not included (Notice: Batteries should be installed by adults correctly for safety, and then close the battery case). 1 Piece 1/24 DIY Dollhouse. - The model with room furniture, LED lights, plants and various daily supplies, without batteries and glue, very lifelike, very beautiful. - It is not finished model, you have to make it all by yourself, build yourself a simple house model. Bathtub (L x W x H): approx. 6 x 2.5 x 1.8 cm. Toilet (L x W x H): approx. 3.5 x 2.5 x 3 cm. 1 x Basin Sink. Suit for: 1/24 Miniature Dollhouse. 1 x Toilet. 1 x Bath Tub. DIY Wooden Victorian Doll House Handcraft Miniature Project Kit Kids Gift Castle. 1X DIY Dollhouse Kit (NOT included the furniture). (It's NOT a finished model. You need to assemble it by yourself.). 1:24 Dollhouse Miniature DIY House Kit Tea House with Furniture Collection Christmas Gifts. 1 Piece DIY Dollhouse. - Enjoy the process of DIY assembling your cake house. Size Chart People always bought together with. Doll House Model Kits New DIY Glass Ball with LED Light Wooden Miniature Assembling Dollhouse Toy Creative Xmas gift. You need following handcraft tools : paper scissors, knife,hole maker,precision tweezers,screw driver, adhesive. 1 Set Wooden DIY Dollhouse Kit (Batteries are not included). - Material: Wooden, Cloth, LED Light, Paper, etc. - 2 Pieces AA (1.5V) Batteries are needed, but not included (Notice: Batteries should be installed by adults correctly for safety, and then close the battery case). The photos show the finished dollhouse but it is a self assembly product. Dollhouse Size:17.1(L) x11.6(W)x13.1(H) cm. Handmade Wooden Doll House Furniture. Handcraft tools needed: paper scissors, knife,hole maker,precision tweezers,screw driver, adhesive. 1x 29pcs Wooden Furniture. Material: Wood. Scale: 1:24. Different realistic designs & vivid color. Color: as pictured. 1 Set Wooden DIY Dollhouse Kit (Batteries are not included). - Material: Wooden, Cloth, LED Light, Paper, etc. - Warning: Chocking Hazard-Small parts, not for children under 12 years old. Due to the light and screen difference, the item's color may be slightly different from the pictures. 1/24 Dollhouse kit DIY miniature wooden handmade house furnished with accessories assemble tool - Antique Chinese Tea House. 1 Piece 1/24 DIY Dollhouse. Finished House(LxWxH): Approx. People always bought together with. 1:24 Dollhouse Miniature DIY House Kit West Bar with Furniture Collection Christmas Gifts. 1 Piece DIY Dollhouse. - Enjoy the process of DIY assembling your cake house. Size Chart Due to the difference between different monitors, the picture may not reflect the actual color of the item. 1 DIY house kit set. assembly, coloring, sewing, modeling, placing and other DIY process. colored specification ( not including batteries, glue, tools ) 4. Application: household decoration, collection, gifts and so on. 1 Piece 1/24 DIY Dollhouse. Finished House(LxWxH): Approx. - The model with fountain, rockery, plant and coconut tree furniture, very lifelike, very beautiful. - Mainly to splicing, containing double-sided adhesive, playing a role of solid assistance. It's easy to finish it following the instruction, just need enough patience. - Enjoy the process of assembling your beautiful warm dollhouse. 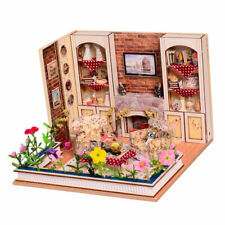 - The dollhouse features very detailed interior design, with vivid miniature furniture set built inside. 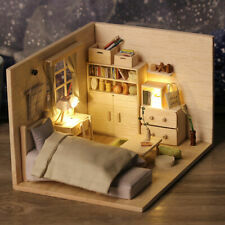 1 Piece DIY Dollhouse. - Enjoy the process of DIY assembling your cake house. - Main Material: Wood. Due to the difference between different monitors, the picture may not reflect the actual color of the item. It's easy to finish it following the instruction, just need enough patience. - The dollhouse features very detailed interior design, with vivid miniature furniture set built inside. Not including dust-proof cover. 1 Piece 1/24 DIY Dollhouse. - Mainly to splicing, containing double-sided adhesive, playing a role of solid assistance. 1 Piece 1/24 DIY Dollhouse. Finished House(LxWxH): Approx. - Mainly to splicing, containing double-sided adhesive, playing a role of solid assistance. 1:24 Dollhouse Miniature DIY House Kit Creative Room with Furniture Collection Christmas Gifts. - Enjoy the process of DIY assembling your beautiful warm dollhouse. 1 Piece DIY Dollhouse. People always bought together with. 1 Piece DIY Dollhouse. - Enjoy the process of DIY assembling your cake house. The Finished Size: Approx. - Main Material: Wood. 1 Piece DIY Dollhouse. - Enjoy the process of DIY assembling your cake house. - Main Material: Wood.